I’m not gonna lie; neutral golden-bronze-y-brown eyes are kind of my all-year-round look. However Autumn gives me an excuse to put together a little round-up of my favourites! I always say this is the perfect palette for neutral-lovers who ‘don’t do colour’ as it has the whole warm brown, gold and bronze thing going on but it also has the pops of red, purple and pink. They’re all at the edge of my comfort zone but nothing too scary if you just pop a bit in the crease and they’re really what makes this palette stand out from the crowd. I think it’s amazing for £15 as the formula is so beautifully buttery and pigmented. I won’t go on too much about this as it was featured in my main Autumn Beauty Edit, however this is my luxe pick. The red and gold tones really are perfect for this season and for a night out look this is the one I reach for. The quality of the shadows as well as the packaging make this feel really special. On the other end of the price scale is this drugstore gem. It has just about everything you need for an everyday neutral eye look. The shades are mostly matte but it also has this amazing red shimmer shade, which is what makes it for me. However you can go for the cool toned browns if you want a more matte look. It’s such good quality for the price and the shades are perfect for Autumn. This does a similar thing to the pink shade in the Zoeva Cocoa Blend but I couldn’t not mention MAC Cranberry. This deep pink shimmer shade is perfect if you want to dip your toe into colour as it isn’t too bright or too intensely pigmented. Again, I just love adding this into the crease when I’m wearing an otherwise brown, bronze or gold eye look. Another one if you’re a bit wary of colour as it almost comes out as a brown with olive tones and a golden shimmer running through. This is really nice all over the lid with a matte brown like Cork through the crease. The light, fluffy mousse-like texture of this eyeshadow is really unusual for a drugstore product. It’s so pigmented and easy to apply. I do think the name doesn’t quite fit though, as to me this is a deep chocolate brown shimmer. It’s the perfect Christmas party eyeshadow in my opinion. My main negative is that I don’t think it lasts that long on the eyelids, however for an evening out (when I don’t need it to stay fresh for 8+ hours) I can make this work for me. Standard disclaimer: yes, this is with a primer, as always. Overall as gorgeous as these mousse-like eyeshadows are, they aren’t as long-lasting as something more solid like the Maybelline Colour Tattoo. Out of all of Charlotte Tilbury’s products, these really don’t get the most attention but I really like her eyeshadow/eyeliner crayons. I really don’t like the lid as it feels cheap and never seems to stay on but maybe they’ll change that. Amber Haze is the most beautiful multifaceted shade, it’s quite hard to describe it. It’s a sort of bronze-amber shimmer that’s supposed to suit brown eyes in particular. Although you get a moment to blend before it sets, once it does it won’t budge at all. There are definitely alternatives to this that are a lot cheaper (such as the identical KIKO eyeshadow sticks or even Maybelline’s On & On Bronze) but lately I’ve been reaching for the luxury of By Terry. Bronze Moon has to be my favourite shade as it’s just the perfect bronze-brown shimmer that’s not too cool or too warm in tone and goes with any neutral eye look. They apply so smoothly and feel so creamy, yet once in place they’re incredibly long-lasting and have a metallic, almost dewy look on the lids. This is a favourite of mine all year round, I must admit. I always have one of the Urban Decay eyeliners in my waterline as I find a colour so much less harsh than black but they still add some definition. The shade Scorch is a beautiful medium golden-bronze shimmer that looks amazing against any of the eyeshadows I’ve mentioned. What are your favourite eye shades for Autumn? I've been lusting after Sumptuous Olive for such a long time! I love a khaki green look with my hazel eyes, especially mixed with a bit of gold/bronze. I've been loving using MAC Cranberry, but in the crease. It's definitely less scary that way. The Zoeva palette looks so gorgeous and I think I love every single shade. It's certainly a perfect palette for this time of year! Lovely picks! The Zoeva Cocoa blen palette is on my wish list for so long! I really need to buy it! The Max Factor Excess shimmer eyeshadow is quite tempting as well! You always do fab eye posts Jasmine, love your picks! The CT palette and Zoeva are on my wish list, I love the look of them! I love my CT Jean shadow at the moment and Chanel Caroube! That Zoeva palette is gorgeous and it`s so inexpensive compared to other palettes. i really want to try it now, read so many good things about it. Yes to all of these! They all look so lovely and perfect for this time of the year! Ah, all those palettes are gorgeous! Perfect colours for Autumn. You have really lovely photos too! Love this! Those colours are so pigmented! You have some really amazing palettes for Autumn, i love Lorac Unzipped in this season. They look so amazing! The lovely autum shades are perfect for a nice fall look. The Browns look amazing! Sumptuous Olive looks gorgeous! It's definitely a colour that I wouldn't be too afraid to wear! I've been meaning to pick up Brixton Brown for the longest time! The Zoeva palette is just sooo pretty - I keep seeing it everywhere which makes me want it even more haha! These are all stunning! I love these warm eye shadows and the cranberry/rust shades are so beautiful!! I'm dying to get my hands on the Zoeva palette!! The Zoeva palette looks stunning! I think this will be the next thing I buy off their website. This Zoeva palette looks so gorgeous, so many rich and beautiful shades. Perfect post and love the look of the Zoeva palette and has a good price too! Those colours are so perfect for this season! I'M IN LOVE! Great choices. Cocoa Blend is a gorgeous palette that I own and love. I am lusting by your other choices especially CT one - gorgeous and MAC paint pot - so pretty !!! my eyes zoomed RIGHT INTO that zoeva palette even before i read the post. damn it! we can't get that brand in canada though i'm sure there's an online store somewhere...the colors look gorgeous for fall! Great post! I've been wanting that Zoeva palette. Shipping would probably kill me. 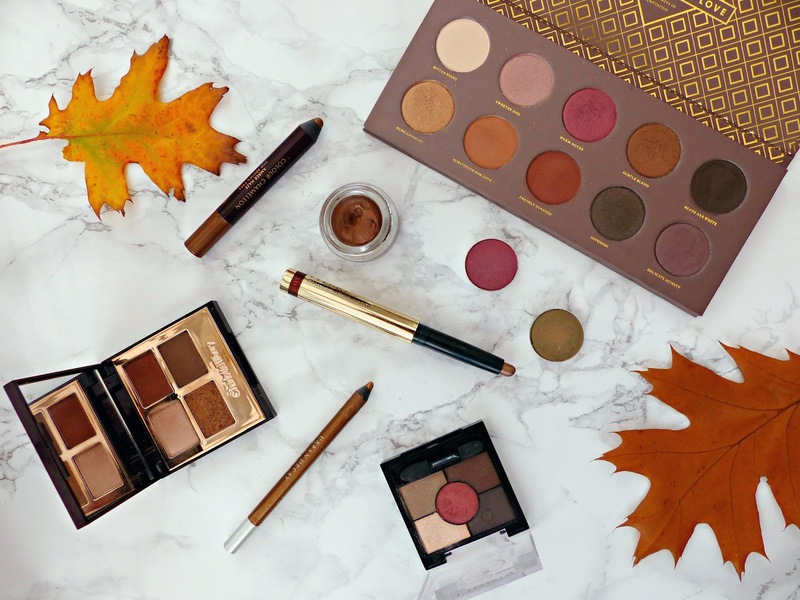 I absolutely love autumn shades on eyes, they look so pretty and those palettes look amazing especially the zoeva and Charlotte tilbury ones! Great post!! I really want the Charlotte Tilbury eyeshadow palette! I love, love, love your picks, and that Dolce Vita palette is absolutely stunning. However I'm itching to get my hands on that Zoeva palette though. Bronze Moon, Amber Haze, and Dolce Vita are all my picks too! Very Fall colors and all such great quality. I've also found that Burberry's Mulberry and Midnight Brown eyeshadows are also really nice!